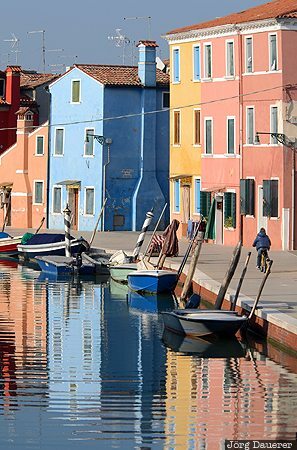 Typical colorful houses in Burano with yellow, blue and orange facades and their reflexions in a canal below a blue sky. Burano is an island in the Venetian Lagoon, northern Italy. This photo was taken in the early afternoon on a sunny day in October of 2011. This photo was taken with a digital camera.